James Harden scored 35 for the Rockets, whose five-game winning streak was snapped when Eric Gordon's 3-point try at the buzzer hit the rim and bounced away. The worst part of the night for Houston, however, will likely be the loss of point guard Chris Paul in the second quarter to a strained left hamstring. Gordon's 3-pointer with 37 seconds left got Houston within two, and the Rockets got a stop on a long ensuing Heat possession. 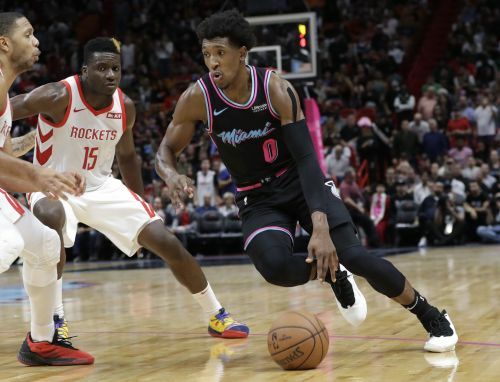 Dwyane Wade missed, Hassan Whiteside got the offensive rebound and Wade wound up missing again, with the Rockets finally corralling the ball with 3.8 seconds left. The last play went to Gordon, and his 3 — Houston's 54th attempt of the night from beyond the arc — was off, and Miami escaped.